What’s happening to the Segwit transaction count??? What’s happening to the Segwit transaction count??? What’s happening to the Segwit transaction count??? Segwit proponents have been for weeks hailing the parabolic increase in Segwit transactions. Not long ago, almost 18% of all transactions were Segwit based. Well it has suddenly dropped back down towards 8%… That is a frightening drop. The parabolic rise has come to an end. 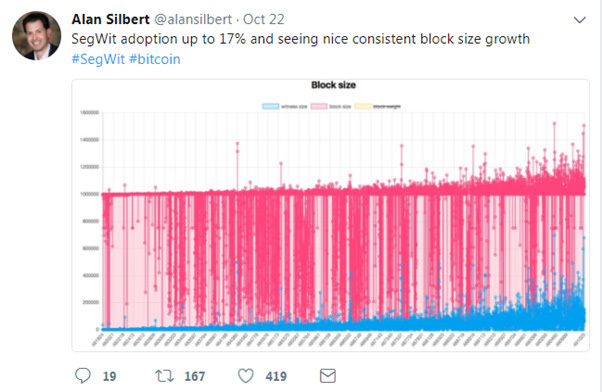 If a service was running and processing such a conversion in bulk, it would also explain how we managed to get an effective blocksize in certain instances reaching almost the maximum Segwit would enable in full capacity. The nature of the soft-fork approach means that this will take a significantly long time before the conversion is ever complete.